Discussion in 'Lighting' started by Daveslaney, 13 Sep 2017. Anyone using the 421 wifi version? There doesnt seem alot of info on these available.Can you program thesse over wifi using your phone or tablet? The demos ive seen on the 420 mainly show sunrise sunsets,Can you vary the intensity at set times through the day to create a miday blast for example in the middle of the photoperiod?Or does it just ramp up to one set intensity then ramp down at the end? Yes you can.. TC421 is simply the wifi version of the 420, the program to regulate the lights is identical.. It registers in your network to your router as a network device. See this for the wifi connection over Android. Over PC it works the same as the 420, you can create a schedule on the PC and download the package to the device and install it, this time over wifi instead USB. I forgot how many, but you can install more modes (schedules) than you ever need into one package. The wifi conection likely enables you to choose the installed modes or even craete a new one. But via PC with PLED program will be with simpler layout and looks like this. I'm still using the 420 on 2 aquariums.. And i have non issues to complain about.. Actualy i do not know if iever buy the wifi version. Creating a proper schedule is a one time job, once all is installed it constantly loops the set mode. There is no need to change it.. After playing some time it is fun, but in the end done playing i only have 2 modes in use. One mode for day time with sunrise sunset in simple natural white colored light. And a panic mode where i can choose full 100% at any time if needed. Wifi connection, fun for controlling a christmas tree, but for an aquarium i don't realy see the need. a1Matt and Daveslaney like this. As this is the first one ill be getting and its only a few quid extra for the wifi one may as well get that,just didnt want it to be more complicated . Creating the mode files is for a start a bit confusing. But once you get it, it's pretty logical and straight foreward.. To keep in mind is the fade function which is default, for example if you ever want to create moonlight effect and you use for example only 5% power from 11 am till 8 pm and than ramp up higher towards the day. Than you should set 5% at 11 am and 5% at 7.59 pm. Than start the day cycle from that point. Else it ramps up slowly to the set value from 8 pm. Lets say start 8 pm with 50% but you didn't set the 5% end point at 7.59am it will be 25% at 4 am (half way). Most people are a sleep at that time and never notice they made that error.. Bottom line, if you want a steady value from this time to that time you always need to specify an begin and end point set the same value, or else it fades in equal steps per hour up till the next set value. As seen in the above pic, the guy who set it up likely never noticed or maybe wants it that way. i dunno.. But he did set 05:00 - 0% and 06:30 - 25% = 12.5% at 05.45 etc. Depending on the sources power could be pretty much for that time of day and a very early start if you keep an 12 hour daylight schedule in mind. fades in equal steps per hour up till the next set value. I've got the TC421 wifi version and to be honest I don't know if it's how I set it up but the wifi function worked for about a day now it crashes any time I try to sync with the unit from my laptop - I don't have any android devices so might be better/easier using the app. I didn't have any kind of controller so am happy to keep this, and again it might be how I've set it up that's causing the problems with sync-ing. What actualy crashes? The laptops connection to the device when you try to sync? So this would mean you see the device in the network but you can't keep the laptop connected tp it? If that is the case and a private laptop, i would give it a try without McAfee installed. First try a safe mode option with network connection.. This means boot windows with only it's essential system drivers, default it is without network, but there is a safe boot network option. Boot into that option and Windows starts minimal with only kernel system drivers and network, the rest will stay dissabled. If you are able to hold connection with this option, than you know there is a non essential likely 3th party driver present and active at normal mode preventing/crashing the connection. Narrows down the search and makes McAfee still the usual suspect to look at.. So in your experience you would recommend going with the 420? The wifi on the 421 would be nice to have for the little extra cost but not something i need if it makes the unit a PITA. Would much rarther have something thats simpler to use. Vandal Gardener and Daveslaney like this. To go through my experience with it - the software is like going back a generation on anything electronic - it's cumbersome and its best to go through each stage and save it, having lost changes a couple of times I think I'm a bit ocd about saving then loading (when I tried to do it in one then it malfunctioned giving me an error message saying the device is not recognised (hardwired) so basically I make sure the changes are saved and that the laptop has found the unit then time sync then load the changes which seems to work). Re the wifi it worked great the first day, then whilst trying to work out the software I downloaded PLED which is when the freezing started but now I can work on the schedule but if I try to sync it via wifi then it just freezes the whole programme, I tried one of the many usb cables in desperation and it worked so have just went from there. My tuppance is I'd get the TC421 because it might be me, or firmware and I'd imagine as it gets more popular then they'll do something to sort issues and you've got the wifi module ready for when and if it gets fixed and at worst use it as a TC420. The only thing in retrospect for me was someone (maybe Marcel) mentioned about kitelite developing it so my conscience was pinged a bit that I might be doing a genuine small scale aquarium business out of money by using the knock off however when I went to Kitelite I couldn't find their own version and it's also a cumbersome website to navigate and I ended up caught up going round in a loop. So gave up. There's a pattern there for me - if I can suss it in an hour or so I'm a happy boy boy but the world of wifi routers et al is a dark art, god knows how I've got this far so far. Would running a solenoid through the TC (whatever number) be the same as setting up the LED's? e.g. use ohms law to determine how many Watts the solenoid is consuming then upgrade the LED driver to new capacity e.g. 2 x 10 w LEDs + (whatever the solenoid's watts + 20% for good measure) and work from there? Right someone please give me coffee! That could work on a 12 volt solenoid, with the jump feature selected instead of the fade. That way it can function as a timer if input is DC 12 volt the output is DC 12 volt. As soon as it starts to fade, iit uses a PWM signal, thats a Pulse on the negative lead.. Wich means it pulses the connection on and off in such a fast frequency that it works the same as dimming. But with the jump function and 100% output it likely just is DC 12 volt at normal frequency you could switch a solenoid on and off.. In theory it should work.. No idea if the solenoid has some build in pcb with extra electronics not liking it. Just a coil creating a magnetic field opening a valve shouldn'be a problem, it is the same principle as running an electro motor. A DC 12 volt motor or centrifugal pump should also run without problems on the TC. Pwm is widely used for motor controling. For the rest, you need some basic logic binary thinking with programming the darn device.. Once you know it is an Aha!! Yes logic! What you need to keep in mind with the TC is it works with 1 package, in this package you create modes. The device can hold 1 package and the package can contain a load of modes. Now if you have NewPackage01 installed with several modes and you create a NewPackage02 with a new mode and download it to the device, NewPackage01 gets overwritten and you loose the modes in there. Because the device only stores 1 Package. Always save and store the complete created package on the PC as file and add new modes to the excisting package to keep previous modes in the device. If it sarts nagging about No Device connected, but it is, use the reset button next to the USB port. Or remove the power for half a minute and reboot the device.. It sometimes happens, thats why the reset button is invented..
Ok so i will order the tc421 if the wifi works i can program it over wifi with phone or tablet bonus!. If not i can program hardwired like reg 420? The power adapter i got with the led is a 6amp unit looking on ebay the 6amp units are rated at 72watt max. The led at 100% is 47w. The solonoid on my co2 reg is 3.9 v.I can run the led on channel 1 then run the co2 solonoid on channel 2 using the original power adaptor that came with the light and get rid of the plug in timer for the co2? I do not know about a 4 volt solenoid.. Tho if you measure the output wit a DC volt meter the voltage goes down when you dim it.. But PWM its i different for of stepping down voltage than regular step down units.. Likely if you add 12 volt PSU to the TC and dim to 35% the channels output will be around 4 volts.. But i have no clue how a DC 4 volt solenoid will work on that. It might start to buzz and heat up. This you have to measure and trail, i never tried that. I only know with PWM if you put 12 volt in and you don't dim it puts the original 12 volt out. So theoreticaly a dc 12 volt solenoid should do..
Also if your leds and PSU are DC 12 volt than 72 watt is to much for 1 channel.. 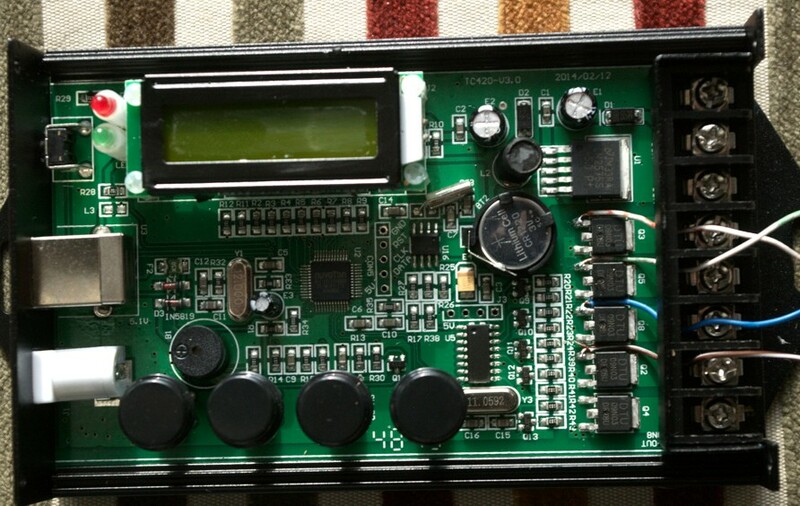 It can only have 48 watt per channel on 12 volts.. On dc 24 volts it can have 96 watt per channel. The psu is 6amp dc 12 volt the led on max intensity is 47 watts. Vandal Gardener and zozo like this. Yes i'm living in denial, i need goggles.. I have a tc420 running a Chihiros 60 fine and dandy. I have a twinstar 90 on the way for the larger tank. I've established that this is a 5 amp light. What are the risks of running through a tc420 given that it has max 4 amp per channel? so there is likely something else going to get hot. At what point it is going to burn out is trail and error.. The risk is, it burns beyond repair.. Thanks Zozo. Would the risk be limited to the tc420 or do you think it could extend to the light and/transformer? Also, I'm guessing not having a fuse increases the risk of fire if abused. Not sure if I want to risk a fire, even if there is 200 litres directly above it. Would limiting the output to, say, 70% make any difference? I would love to know of any similar alternatives or possible hacks to tc420.